UP Board results 2017 for classes 10th and 12th are finally out at upresults.nic.in and upmspresults.up.nic.in. However, students and parents trying to view their results on the official were not able to log in with the website server crashing due to heavy traffic. 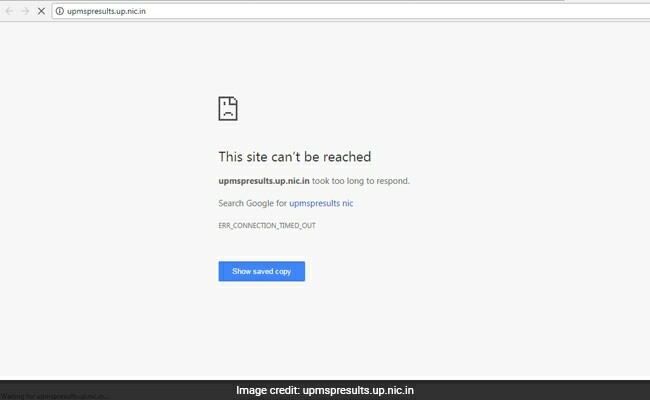 Lucknow: UP Board results 2017 for classes 10th and 12th are finally out at upresults.nic.in and upmspresults.up.nic.in. However, students and parents trying to view their results on the official were not able to log in with the website server crashing due to heavy traffic. UP Board result for classes 10 and 12 were declared by the Director of Secondary Education UP, Amarnath Verma, at a press conference in Allahabad. Candidates will soon be able to view their results online, he added. Over 60 lakh candidates appeared for UP Board exams in 2017 - 34,04,571 students took Class 10th exam while 26,24,681 appeared for Class 12th exam. News agency ANI reported that the pass percentage for Class 10 stands at 81.6 per cent while that for Class XII is 82.5 per cent. Fatehpur's Tejasvi Devi and Priyanshi Tiwari topped Class X and XII UP Board exams with 95.83% and 96.20% respectively. "The results shown here are for the purpose of verification of Student Data only, In case of any discripancy Board of High School and Intermediate Education U.P.,Allahabad may be contacted for clarification," says a notice on the official website.